WASHINGTON (Reuters) - U.S. efforts against Islamic State militants in Iraq are "a drumbeat, a steady building pressure" on several fronts that will ultimately enable Iraqi forces to launch a counteroffensive at a time of their choosing, the top U.S. military officer said on Thursday. 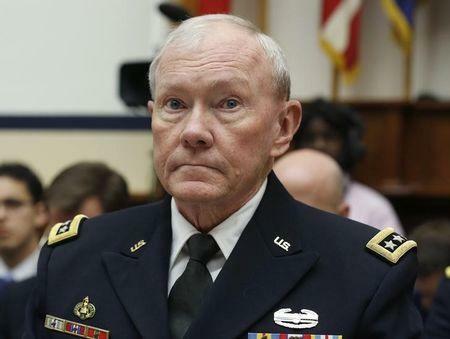 General Martin Dempsey, chairman of the Joint Chiefs of Staff, said U.S. forces were not sitting idly in the key Iraqi cities of Baghdad or Arbil waiting until spring to launch an offensive but were actively working to weaken Islamic State in several areas. "When you ask me what are the prospects for a spring offensive, we're working with Iraqis, military and civilian leaders, to determine the pace at which we will encourage them and enable them to do a counteroffensive," Dempsey said. "But I want to make sure I also highlight the fact that this isn't about ... waiting till the spring to do anything." "This is a drumbeat, a steady building pressure on ISIL along eight or nine lines of effort: counter-financing, counter-foreign fighters, counter-message as well as the military operations," he added, using an acronym for the Islamic State group. Dempsey's spoke to reporters after meeting with his Israeli counterpart, Lieutenant General Benjamin Gantz, to discuss regional security and military cooperation as Gantz winds up his tenure as the chief of the Israel Defense Forces general staff. Dempsey said Iraq would initiate a counter-offensive against Islamic State when Baghdad felt it was ready to conduct the necessary military operations to recapture territory and follow it with humanitarian and reconstruction efforts. "In the meantime we're keeping steady pressure on and we're building their capacity," Dempsey said. He said several hundred Sunni tribesmen had been incorporated into Iraqi Security Force, a sign the mainly Shi'ite government was trying to become more inclusive. He also said several thousand troops had been newly trained. The chairman said U.S. forces were looking for ways to help Iraqis cope with improvised explosive devices, roadside bombs and houses rigged with explosives. "There's some things that we can do to help the Iraqi Security Forces reduce their casualties as they go forward and we're discussing that with them," he said. The Pentagon said this week that U.S. forces have hit or damaged some 3,222 Islamic State targets in Iraq and Syria since August. U.S. military officials also said the department is looking into complaints that civilians may have been killed in U.S. air strikes.